it is not about seeing the future as an extension of past ideas, but rather a disposition/approach which facilitates the creation of meaningful new ideas. m.c.t. is Daishinsha's innovation consulting team, supporting clients' human-centered innovation through our design-research approach. Having been trained in Alan Cooper's persona method by Forrester Research, m.c.t. incorporated persona creation service in 2002, since providing personas for communication design in industries ranging from housing and home appliances to mail order catalogs and financial institutions. Aiming towards more fundamental problem solving, m.c.t. found opportunities across different innovation fields, and in particular, ethnographic research with Larry Keeley at Doblin. Afterwards, m.c.t. developed in-house innovation consulting services featuring ethnography and persona methods. Recommended by Doblin, we contracted with Professor Vijay Kumar of Illinois Institute of Technology, Institute of Design. Since then, m.c.t. has engaged in periodic training sessions and meetings with Prof. Kumar as part of strengthening our skills in facilitating human-centered innovation. 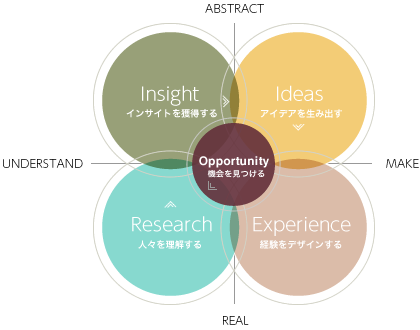 Developed from an experience design project for Saiseikai Kumamoto Hospital, m.c.t. 's patient experience map was exhibited at the International Modern Hospital Show in 2004, receiving a very positive critical reception from the medical profession. In addition to many healthcare-related design projects such as hospital experience, nurse stations, and in-store pharmacies, m.c.t. carried out other projects across a broad range of industries; collaborating with product designers, architects, food coordinators, and furniture designers for developing a range of new offerings from candies to experimental devices. In 2005, our communication and promotion plan for Daiwa House's EDDI's House Project was nominated as finalist for Forrester Research's VOICE'S OF CUSTOMER AWARD and invited to the ceremony in New York City. Proposed solutions directly linked to promotional activities such as quantifying persona with data mining and evaluating persona with transaction data. In 2006, m.c.t. hosted a series of Healthcare Design Seminars by inviting the firm Architect Hawaii (architects and interior designers of Kameda Sogo Hospital) and the Swedish design consulting firm Ergonomidesign (now Veryday). In 2007, we established a Persona Design Consortium, and published the book 'Persona Strategy' (Diamond). In 2008, our persona methods and cases were broadcast on a special episode of the well-known Japanese business program, World Business Satellite. We also participated at EPIC2008 (Ethnography Praxis in Industry Conference), and the user research and spatial design work we conducted for the Morikawa Research Lab of Tokyo University was awarded by AICA Space Design Contest. In 2009, our article on the innovation in patients' hospital experience project was featured in the Journal of Business Strategy. At EPIC2009 in Chicago, we hosted workshops called 'Focus on Emotions to Provide More Actionable' and 'Insights for Business Designers' along with 'Empathic Design Process'. In 2010, m.c.t. obtained the license to use ZMET from Olson Zaltman Associates. We quickly began building relationships across nine countries around the world to collaborate with other global partners in the field of ZMET and ethnographic research. In 2011, m.c.t. obtained the license for offering ClueScan as part of our services from Experience Engineering, and in 2012, we started a business alliance with Innerscope Research in Boston. Also in 2012, m.c.t. co-hosted an innovation seminar for emerging country clients with Mexican design consulting company INSITUM. In 2013, as a member of the Service Design Network (SDN), we hosted a workshop called 'Secrets of Shinise? Learn Experience Design from Japanese Culture' at the first SDN Japan Conference. Towards the end of year in 2013, m.c.t. collaborated with Indian research consulting firm Convo on an innovation seminar for the Indian market. Planning to have a service design project with a former Live/Work consultant Jaimes Nel. Taking on global design projects across Europe, the United States, Japan and Korea. The Division and m.c.t. have previously collaborated on the development of experience design frameworks. Research and consulting firm featuring their patented ZMET service based on cognitive psychology and neuroscience theory, and used in order to understand user subconscious perceptions. Developers of ClueScan, a methodology for strategically managing customer experiences by helping to illuminate aspects, or "clues", of the customer experience across the five senses. Offering advanced biometrics techniques for quantitatively measuring an individual's emotional stimulation via biological responses, helping to reveal insights for improving communication strategies. FocusVision builds technology that helps researchers conduct more effective qualitative research while greatly improving economic efficiencies in the process.